Power take off is a mechanical device used to transmit engine power to auxiliary equipment. Power take offs can be mounted on either a main or auxiliary transmission. If the power take off is operating on the transfer case and its operation is distance dependent, its rotational speed is given in revolutions per meter off distance covered. All power take offs are specially designed for driving hydraulic pumps to SAE J744C series 'B' specification with spline input shaft and either two-bolt or four-bolt fixing. The maximum power which can be transmitted is 22KW(29.5bhp) per 1000rev/min engine speed, this equates to a torque of 209 Nm. Power take offs are desirable in many applications. They are used in oil field pumping service, hydraulic application, in automotive industries, agriculture industries, etc. PTO can also be transmission mounted or engine mounted. 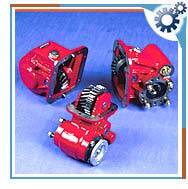 In transmission mounted PTO, it is located on the side, bottom or rear of the transmission. For manual transmissions the PTO is generally driven from a countershaft gear, but can also be found being driven by the reverse idler gear. For automatic transmissions, the PTO will either be driven before the torque converter and be subjected to torque converter slip. In engine mounted PTO, it is located at the rear of the engine. The PTO can be driven from the timing gears, or a special gear train, and provides a constant drive for special applications. A power take off and the power take off drive shaft of a machine are very dangerous if not correctly guarded. Every year people are killed or seriously injured in accidents. Most of these accidents involving are preventable if the PTO and PTO drive shaft are fitted with guards of good design which are properly used and maintained. PTO should be protected with a shield that is well constructed and capable of supporting a downward load of at least 120kg. When the PTO is not in use, it should be covered with a fixed cap. The inner and outer surface of the guard should be cleaned daily and lubricated weekly with lithium-based grease. Torque limiters, free wheels or clutches should be located at the power-input connection of the PTO drive shaft. One should never try to clear blockages from the PTO- driven machine while it is moving. One should always disengage the power drive or stop the tractor engine. Ensure that controls are in neutral and the hand brake is applied. Wait for all movement to cease before attempting to clear any blockage and use a tool to clear the blockage. One should not drive the machine too fast. If a machine is used in excess of its design speed it will come under too much stress and there is a possibility of it disintegrating.